The holiday weekend has almost arrived! Hope everyone has lots of fun activities planned for the next 4 days. We are at our shore house enjoying summer living, and hopefully the weather will turn in our favor to get us on the beach today! Preheat oven to 350 degrees. Toss onions and garlic in a bowl with a little oil and coat evenly. Place on baking pan and roast for around 40 minutes. Let cool. Peel garlic, then place it with onions and cream cheese in a food processor. Puree until mixed. Season with salt and pepper. Serve with raw veggies and chips/pretzels, or refrigerate until ready to serve. 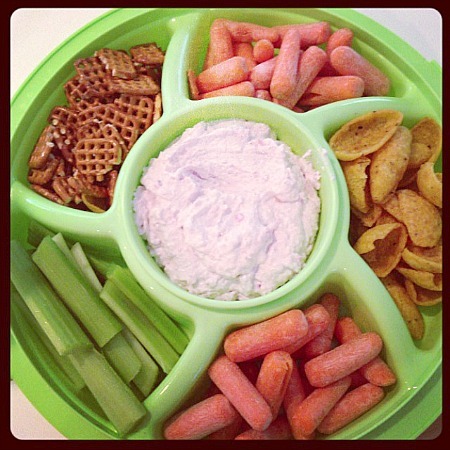 This entry was posted in appetizers, dip, low carb, make ahead, snacks. Bookmark the permalink. Oh Melissa, I really like this idea. I’m not a huge fan of red onions, but I want to be, so I’m always up for new recipe ideas. Thanks for the tip on doubling the recipe too. Hope you enjoyed the holiday weekend! Making this , your cheese ball and the bacon/leek bites for Thanksgiving appys! Never have had anything that is less than delicious from your blog! Happy Thanksgiving! Thanks Felicia – you too! !